Bust adjustment: simple techniques to adjust the bust for a perfect fit! While some commercial and indie pattern companies will offer a variety of cup sizes, the majority do not. Often times, the bust dart is drafted to fit a B cup. We know that every woman is not a B cup! If your bust is larger or smaller than a B cup, you’ll need to know how to adjust your pattern accordingly. Is there anything worse than cutting your fashion fabric and finding out that the garment is ill fitting?! YIKES – that’s why I stress always making a muslin (toile) before touching your fashion fabric. There are a variety of bust adjustments you may need to make. For example, your bust may be higher or lower than the “standard” bust height. Alternatively, you may need to increase (or decrease) the size of the bust dart. 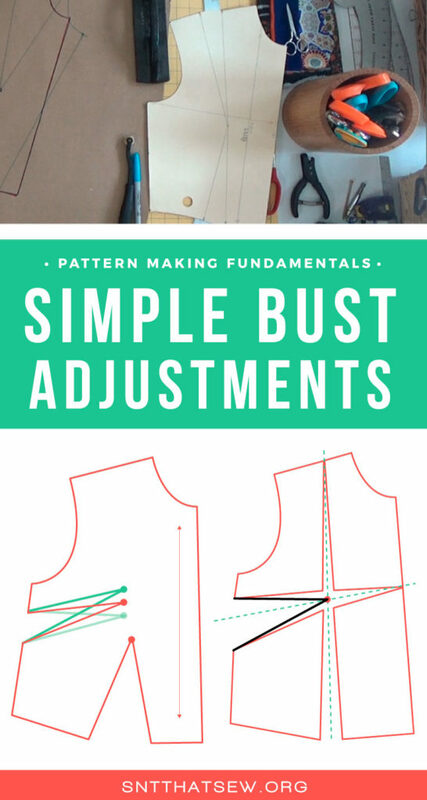 Let’s take a closer look at these simple techniques to adjust the bust for a perfect fit! *TIP* As a general rule, when you are slashing (or cutting) pattern pieces, always shoot for ¼” per cup size for anything over a B cup. If you have a high or low bust you may want to adjust the bust point on your bodice pattern. The bust point is almost always going to be marked on the bodice pattern. If it’s not, find yourself a new pattern company to support! The first thing you need to do is determine the approximate distance you need to move the bust point. I cannot tell you how far you may need to move the bust point. You’ll need to make a muslin of the pattern and perform your own fitting to determine this measurement. It requires a little more work to increase the bust dart. While there are multiple ways to make this adjustment, this is just an alternative way of making a full bust adjustment. You can see another option in my post about adding a dart. The first thing you’re going to need to do is slash your pattern. Make sure to slash through the bust point. *The point in which you slash to but not through is determined by the position of the bust point. To decrease the size of the dart, often called a small bust adjustment, simple do the same thing, but in reverse! 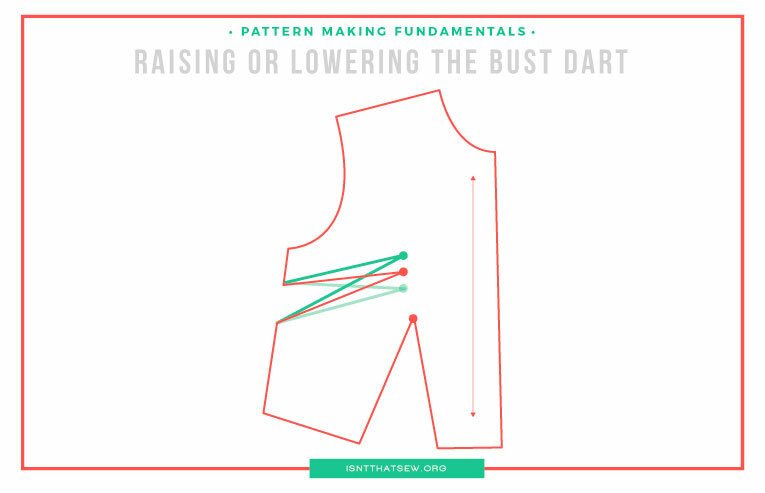 Slash you pattern along the bust point and overlap the pattern by the required amount. The new dart should be smaller than the original patterns darts. If you have a larger bust, odds are that you may need to perform multiple bust adjustments. In that case, I’d recommend performing one adjustment at a time. First, adjust the height. Then, adjust the size of the dart. With that said, there is no one right way to make a bust adjustment, full or small. Remember, pattern making is an art, not a science! Pattern making is an art, not a science! My best advice – make a muslin (toile) first…and then make pattern adjustments…and make another muslin…and do that as many times as needed to perfect the fit of any pattern. Don’t be afraid to experiment with your pattern adjustments my friend. The more you experiment, the easier and more intuitive your adjustments will become! Good luck and keep me posted! wow! that is a chunk of superb post! Thanks for sharing your post with us. Thanks for the tip. Am actually working on adjusting a pattern currently. Keep us updated. I think I will like this better than how I was doing it. Really looking forward to try it. Thanks for your generosity. Love it! I always used to fit the patterns. Now with a double mastectomy, obviously, I don’t! But I always had to make major adjustments for my daughter, and this is exactly what I had to do. Great stuff — keep up the good work! Excellent post, I have been battling with a similar issue, I will try this method. Thanks, Gloria! Let me know if you have any questions.